Q: How Many Strawberry Plants Per Person? I want to plant strawberries this year. How many strawberry plants per person do I need to order to feed each one with enough berries? Thanks for the help. Answer to: How Many Strawberry Plants Per Person? You’ve made a great choice! Strawberries are a wonderful treat and, in my humble opinion, should be a permanent fixture in everyone’s garden. It can be difficult to predict how many strawberry plants to order when planting for more than one person, however. The following guidelines should be helpful. First, each strawberry plant will typically produce about a quart of strawberries per year. Varieties like Ozark Beauty (an everbearer) will produce two main crops and a few scattered berries throughout the year. When added together, they will usually total about a quart of total production. Varieties like Tribute and Tristar (day-neutrals) will produce scattered berries throughout the growing season, sometimes up until the first frost. Their berries are usually a bit smaller, but they can also produce up to a quart in the right environment. Finally, the most popular varieties are usually June-bearers that produce one major crop of larger berries, usually totaling a quart or more of total production. For larger-scale production, the amount of strawberries produced using different methods can be found here: How Many Strawberries Do Strawberry Plants Produce? Also, for even larger areas, see here: Strawberry Plants Per Acre. Generally speaking, however, for fresh consumption only, a minimum of 6 to 7 plants per person would be required. 30 to 35 well-cared-for strawberry plants should feed a family of five. If you plan on freezing strawberries, 50 to 60 strawberry plants would be more advisable – at least 10 plants per person. These numbers are the minimum. Should you and yours be voracious strawberry eaters, it is a good idea to increase the number of strawberry plants per person to at least 10 for fresh eating and 100 or more for preserving for year-round consumption. Be sure to read the information on the Growing Strawberries reference page to get your plants off on the right foot once you’ve planted them. And, remember that late-season care is vital for maximum strawberry production. The care you give your plants in August and September will, in large part, determine the amount of strawberries you harvest the following spring. The perennating buds are developing during that time. Those buds will turn into the following spring’s strawberry flowers, and eventually strawberries. To get the best price on your strawberry plants, be sure to compare prices by using the Buy Strawberry Plants directory. do I need to plant more than 1 plant to produce berries? No, most strawberry plants are self-fertile, but planting more plants of different varieties will often increase the harvest. Good luck! I have a question concerning strawberries and the amount to get for 220×300 ? 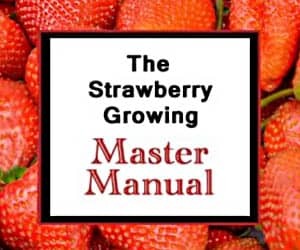 Use the examples on the Growing Strawberries page to calculate how many you need for that area. Good luck!